Our Outdoor Learning Consultant, Sam Flatman, thoroughly enjoyed working with Forres Primary school to develop their early years outdoor learning environment. With such a large space in need of development, it opened-up an exciting opportunity to promote new and engaging ways to encourage children to learn outside of the classroom. 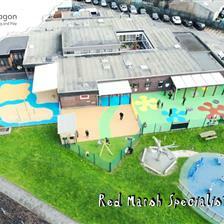 The plan was to create a space that would offer children as much variety in their play as possible. We needed to install school playground equipment that would inspire imaginative play, investigative thinking, expressive arts and physical activity. Our bespoke and unique surfacing, had the biggest impact on the school's early years environment. The abundance of bright colours and artistic splashes, make the environment a fun and inviting place to play. 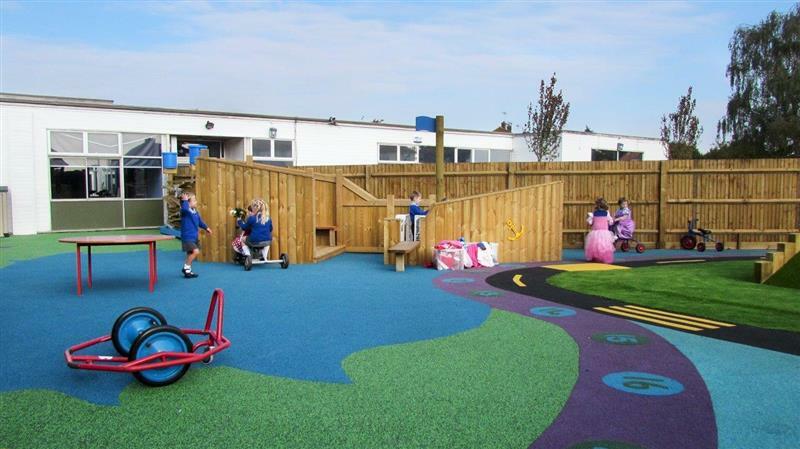 As well as making the area safe for risk taking, we also used different colours and types of surfacing to zone different areas of the playground. You can view our huge range of playground surfacing here. Within the playground, the sensory play equipment, was purposely spread and placed into their own styles of play groups. We created zoned playground spaces for these individual styles of messy play, to ensure the surrounding areas of each resource stay much easier to maintain after a messy play session. These zones also make it easier for groups of children to move from one style of messy play, to another. Teachers will also be able to target different areas of learning and teach children about relatable curriculum topics. Children now have multiple areas to play in, rather than having all the sensory resources combined in one area. The first area focuses on the use of mud in play and links three mud related resources together, to encourage team work and group play within the playground. When the Mud Kitchen runs low on ingredients, children can work in teams to collect mud from the Dig Pit and transfer it back across to the Mud Kitchen via the Rope and Pulley System. The second messy play zone, includes our Water Wall and Covered Sand Box. The Water Wall is a fantastic resource, that can be linked with topics across the curriculum, to help aid the teaching of science and maths in a fun and interactive manner. The third messy zone, includes Tuff Spots Tables, which are extremely versatile resources for all types of messy play. Children can draw, paint, mix components and use the surface for their toys. You can view all of our Messy Play equipment here. 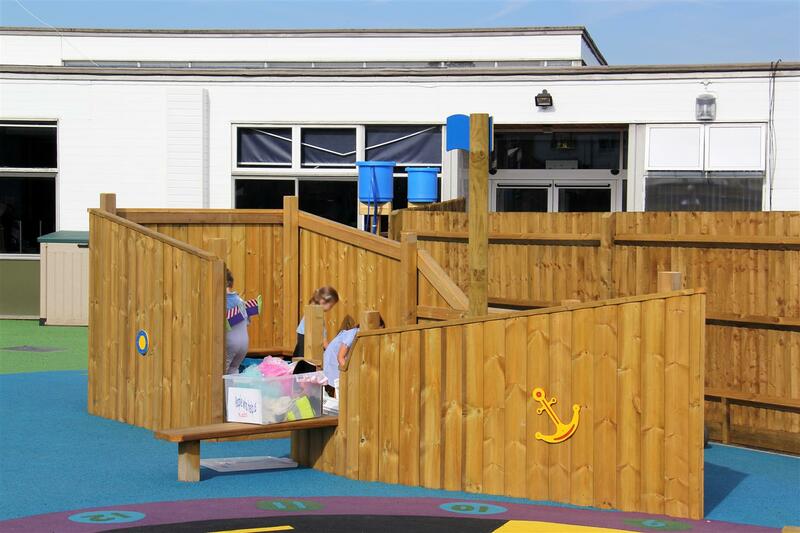 To encourage imaginative play, we installed our Play Ship which will become the focal point for child-led games. 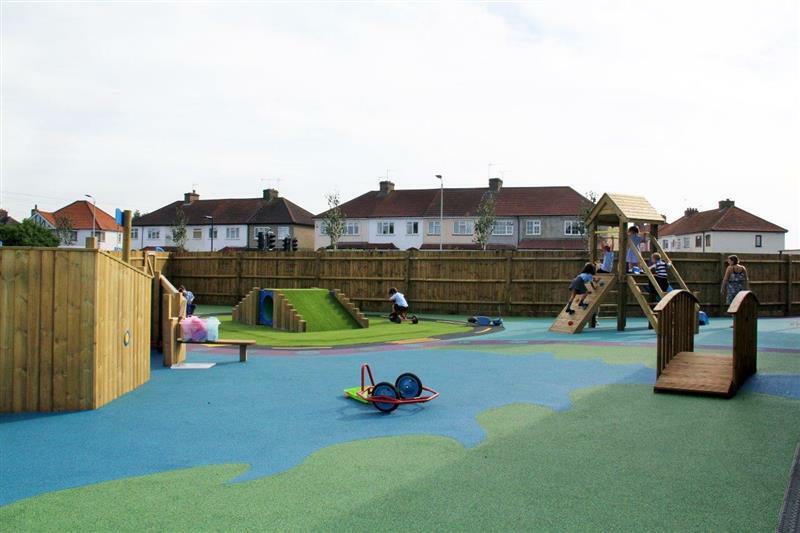 Children will be able to transport to several imaginary environments and use the surrounding resources and Wetpour Surfacing to interlink and create new imaginative playground activities. For example, they could sail out to sea, with the rest of their merry Pirates, to conquer the island (Climb Through Tunnel with Ramp Over) and search for the legendary buried treasure. We added our Easel Table to the environment to develop children’s drawing and writing skills. As the children grip and hold different sized pens and chalks, they will naturally begin to develop their fine motor skills. The table also acts as a social zone for children to talk and discuss what they are drawing and share ideas, techniques and inspiration to help out their friends. 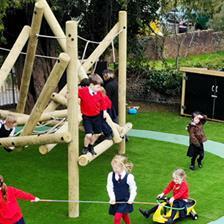 You can view our range of Imaginative and Creative playground equipment here. With such a large outdoor space, children have plenty of room to run, roll, jump and improve their gross mot skills. To add to this, we installed two active playground resources to target specific areas of physical development. Single Tower Unit – Designed to slowly build children’s climbing confidence and prepare them for the harder challenges they will face on future playgrounds. Climb Through Tunnel with Ramp Over – This resources helps to build children’s core strength, stability and balance as well as being a great group resource for pretend play. You can view all our Active Playground Equipment here. We created and installed a Bespoke Multi-Use Canopy, that will be used by both the children and staff during lessons and outdoor play. 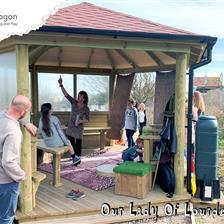 The canopy can also be transformed into an outdoor performance stage, giving the children a platform to express themselves and build self-confidence. 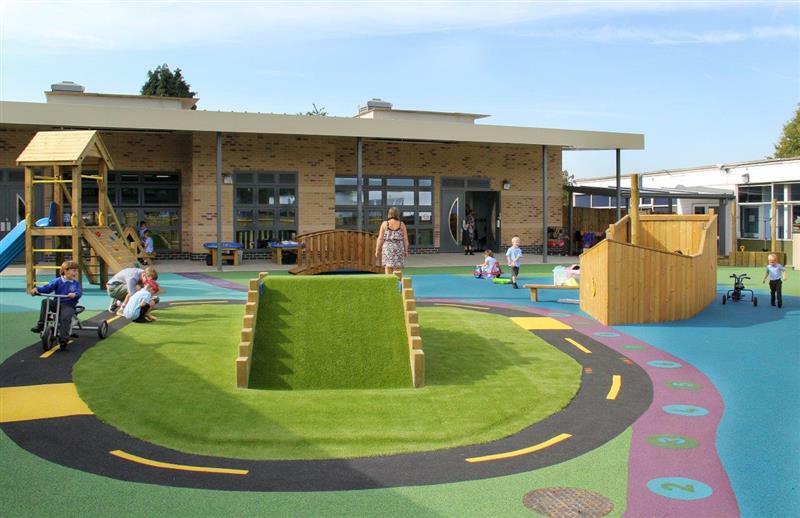 To brighten up the space and further inspire the children, we re-surfaced the area with our bright blue Saferturf Safetey Surfacing. We have the ability to create bespoke designs, take a look at other bespoke canopy designs here.